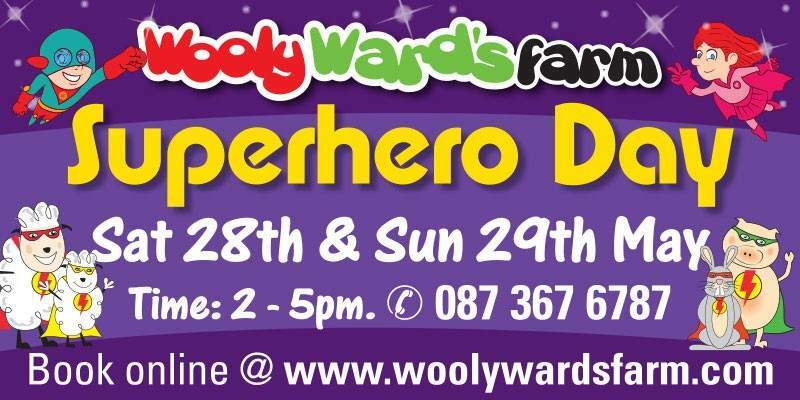 Wooly Ward’s Farm is delighted to announce its Superhero Event on the weekend of Saturday the 28th and Sunday the 29th of May from 2-5pm. Following on from a very successful Easter Extravaganza they are hoping to have a fun filled weekend. Activities include: Superhero Challenges - receive a certificate, Make Superhero masks, Meet the Woolie Superhero's, Bouncy Castles, Summer Show - Alice in Woolyland and Decorate Superhero Cookies.